By Keith Cowing on July 31, 2012 11:25 AM. "The Committee will meet to consider the following measure, or for other purposes: H.R. 4158 - To confirm full ownership rights for certain United States astronauts to artifacts from the astronauts' space missions." Keith's update: This markup has been postponed. 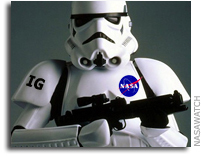 Keith's note: It should be abundantly clear by now that the NASA IG and General Counsel offices have no consistent policy whatsoever when it comes to selling historic Apollo era artifacts. In some cases you can sell pieces of the Moon, and in other cases you cannot. In some cases you can sell items used during Apollo missions, in other cases, you cannot. And of course, it is also acceptable practice to rough up little old ladies and threaten lawsuits against elderly former astronauts. Maybe this legislation will solve some of this confusion since it refers to some specific items "personal logs, checklists, flight manuals, prototype and proof test articles used in training, and disposable flight hardware salvaged from jettisoned lunar modules" which astronauts can keep and specifically excludes "lunar rocks and other lunar material" which they cannot keep. House Committee on Science, Space and Technology Markup on Astronaut Artifact Ownership\n\n\"The Committee will meet to consider the following measure, or for other purposes: H.R. 4158 - To confirm full ownership rights for certain United States astronauts to artifacts from the astronauts' space missions.\"\n\n- NASA IG Sends Cops in Flack Vests After 74 Year Old, 4'11\" Grandmother, earlier post\n- Selling History Or Just Personal Stuff?, earlier post\n- NASA OIG Admits The Obvious About Moon Rocks, earlier post\n- NASA's Inconsistent Policy Regarding The Sale Of Apollo Era Items, earlier post\n\n Keith's update: This markup has been postponed.\n\n Keith's note: It should be abundantly clear by now that the NASA IG and General Counsel offices have no consistent policy whatsoever when it comes to selling historic Apollo era artifacts. In some cases you can sell pieces of the Moon, and in other cases you cannot. In some cases you can sell items used during Apollo missions, in other cases, you cannot. And of course, it is also acceptable practice to rough up little old ladies and threaten lawsuits against elderly former astronauts. \n\nMaybe this legislation will solve some of this confusion since it refers to some specific items \"personal logs, checklists, flight manuals, prototype and proof test articles used in training, and disposable flight hardware salvaged from jettisoned lunar modules\" which astronauts can keep and specifically excludes \"lunar rocks and other lunar material\" which they cannot keep. This page contains a single entry by Keith Cowing published on July 31, 2012 11:25 AM. GAO on Federal Liability Risk for Commercial Launches was the previous entry in this blog. Survey: U.S. Space Industry 'Deep Dive' is the next entry in this blog.